The Alhambra acoustic guitar is made with great craftsmanship and creates beautiful music. Try one at our showroom and experience the brilliance. Vídeo presentación de los nuevos modelos profesionales 2013.Introductory video of the new professional models 2013. Spanish made, solid cedar top nylon string guitar with an "Open Pore" finish. This allows the sound to have fantastic resonance. Currently sold out, more on order. 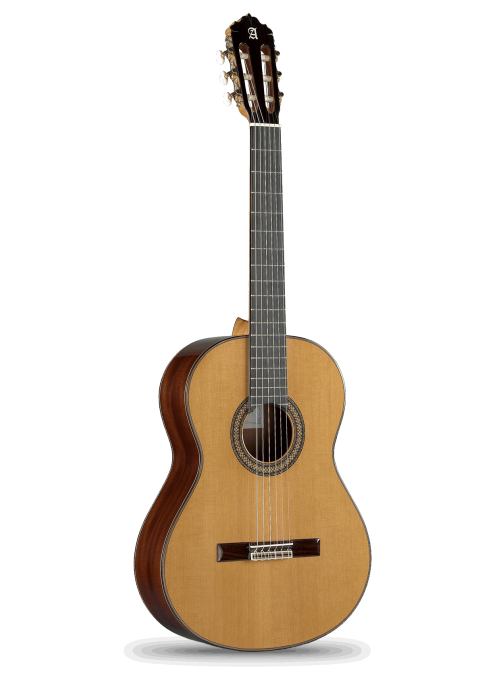 Spanish made full size nylon string guitar, great for the beginner/intermediate level player. solid spruce top, mahogany back and sides with a rosewood fingerboard. 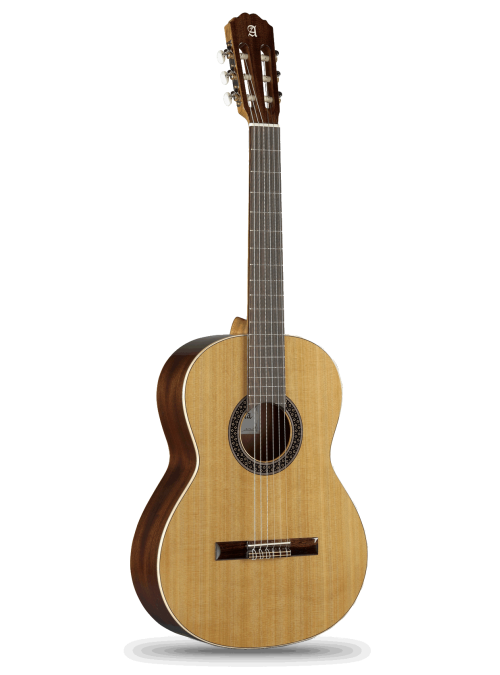 Spanish made 3/4 size nylon string guitar, great for the beginner/intermediate level player. solid spruce top, mahogany back and sides with a rosewood fingerboard. 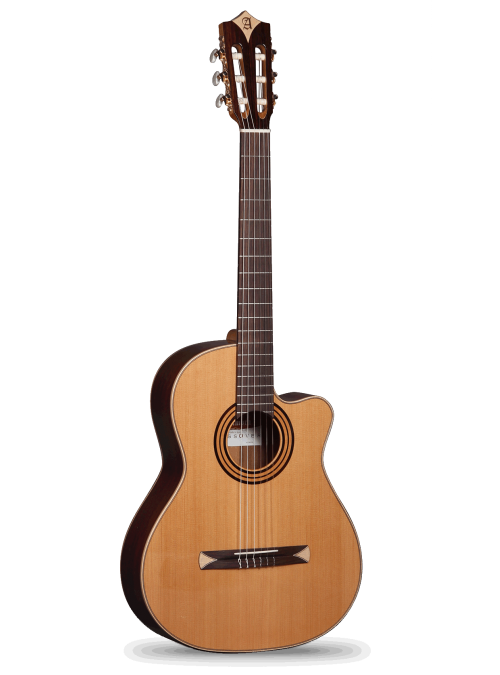 Spanish made 7/8 size nylon string guitar, great for the beginner/intermediate level player. solid spruce top, mahogany back and sides with a rosewood fingerboard. 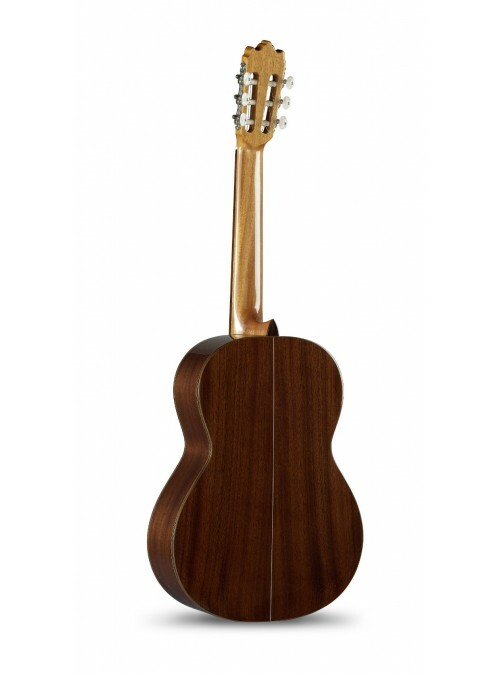 Spanish made 1/2 size nylon string guitar, great for the beginner/intermediate level player. solid spruce top, mahogany back and sides with a rosewood fingerboard. Spanish made full size nylon string guitar for the intermediate level player. solid spruce top, mahogany back and sides, rosewood fingerboard and detailed body binding. Spanish made, handcrafted all solid wood Classical guitar. solid spruce top with solid mahogany back and sides and an ebony fingerboard. Fantastic sustain and tone for the more accomplished player. Spanish made, handcrafted all solid wood Flamenco guitar. Solid German Spruce top, book matched solid Cypress back and sides and an Ebony fingerboard. Bright, vibrant and percussive for the more passionate Flamenco styles. Spanish made, handcrafted all solid wood Classical guitar with solid German spruce top and Indian rosewood back and sides. This model has a mahogany neck with a reinforced ebony strip which helps conduct tonal vibrations throughout the entire instrument. Finished with an ebony fingerboard and gold plated hardware. Made in Spain by a select team of luthiers, this all solid wood guitar features a Solid German Spruce top, Solid Indian Rosewood back and sides, Red Cedar neck reinforced with an Ebony strip. Finished with an Ebony fingerboard and gold plated hardware. Made in Spain by a select team of luthiers, this all solid wood guitar features a solid German spruce top, solid Indian rosewood back and sides, Spanish red cedar neck reinforced with an ebony strip. With it's bridge shaped cross bracing pattern it delivers maximum volume and projection. Finished with an ebony fingerboard and gold plated hardware. Spanish made acoustic/electric guitar with a Solid Spruce top. A narrower slightly radiused neck profile and body cutaway make this guitar a joy to play all the way up the neck. Comes with a Fishman Prefix Pro Blend pick up system.